After enjoying holiday Bollywood turned Hollywood actress Priyanka Chopra had back to her Hollywood film project at New York. From past days, Priyanka was busy doing her shooting for the film Isn’t It Romantic. Now, some pictures from the set are doing the rounds on social media in which the caste from the film is having the fun time including PeeCee. It seems like that it was the wrap-up of the film, that’s why the film team is enjoying their fun time on the sets of the film. Bharat actress can be seen in the photos that she was too happy and full on masti mood as she was dancing and laughing without any worries on the film set. The Quantico actress also took to her Instagram account and shared some photos in which her whole cast and crew can be seen. 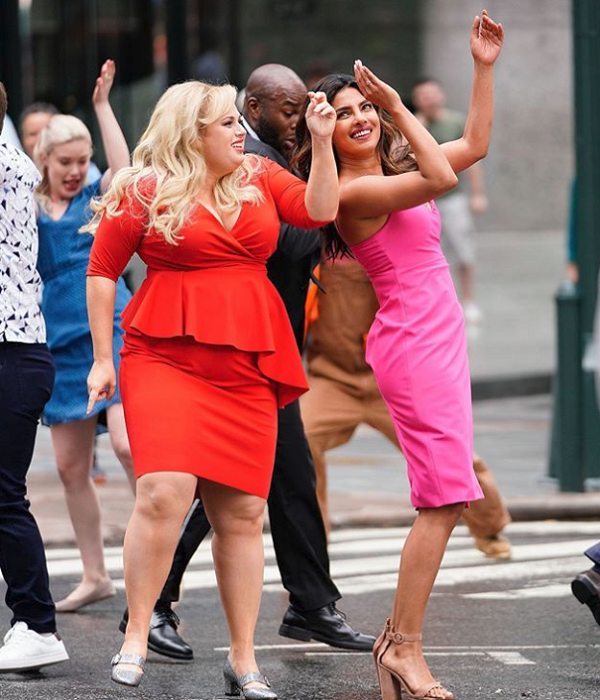 Besides, Priyanka, in the viral photos, Rebel Wilson, Liam Hemsworth and Andy Bovine also seen doing masti. However, Rebel Wilson also shared photos from the set and also wrote a long message. We must say that our Priyanka is banging on with her dancing moves and carefree in doing masti with her Hollywood team.